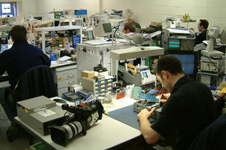 Electronic Sound's service personnel can perform on site service repair. Service request can be schedule at the customers convenience so their facilities activity wont be disturbed. Electronic Sound and Equipment Co., Inc. also has the capacity to bench test and repair old or new out of warranty equipment. Please call to inquire about this service. Not all equipment is serviceable.